“Dance is a Weapon” exhibit. Getting to Angers, France was an adventure in itself. I was able to dust off my French to change some of the dancers’ train tickets to stay in Paris for a few hours. We locked up our bags at the station, then walked along the Seine river, saw the Eiffel Tower, and got a delicious Parisian breakfast. The train to Angers yielded picturesque views of French countryside chock-full of roaming cows, ancient stone houses, and rolling hills. The Eiffel Tower on our first, cloudy morning in Europe. Angers itself is a quaint town complete with the glorious Cathédrale d’Angers, the sturdy 13th century Château Angers, and the steady Maine river which clips the town in two. We were fortunate enough to have the first few days off to explore the Loire valley. We took a long van ride through ancient villages to the town of Saumur where we saw the fantastical Château de Saumur and explored and ate lunch at the sprawling Château Villandry. View from across the river Maine. The grounds at Chateau Villandry. 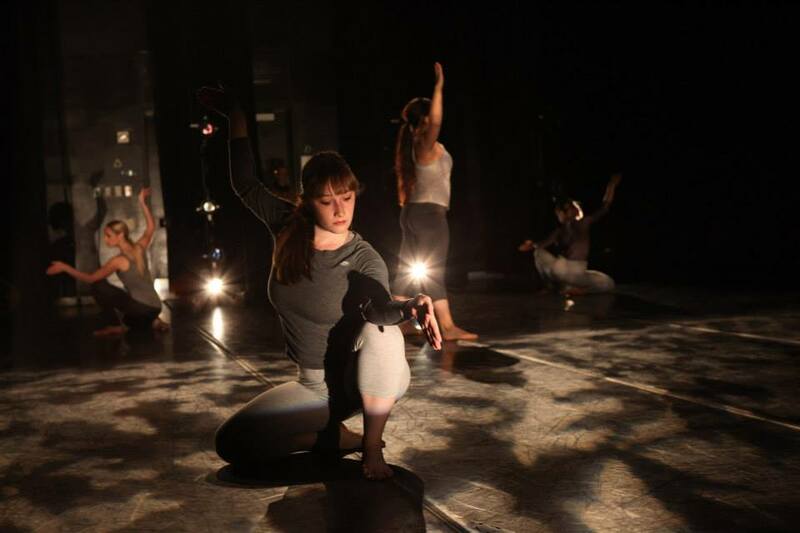 The Liz Gerring Dance Company in residency for Horizon. Photo by Miguel Anaya. Before rehearsals, we had the pleasure of taking Cunningham class from Robert Swinston alongside his company’s dancers. Swinston was appointed the artistic director of the CNDC Angers in 2013, where he teaches Cunningham class, re-stages Cunningham’s dances, and creates his own works. 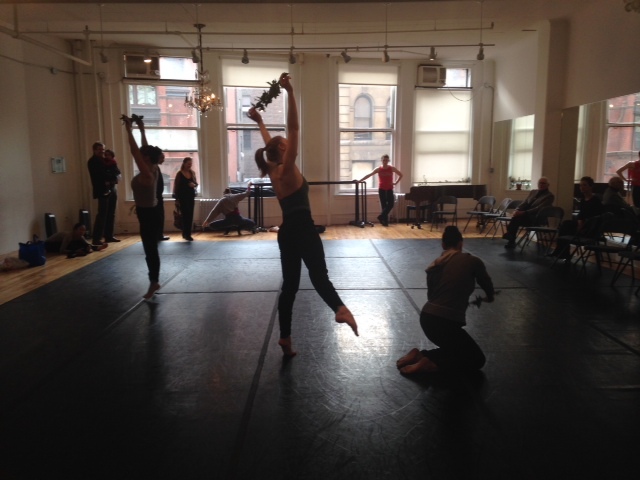 Liz Gerring Dance Company and Swinston’s company were able to show-and-tell their dances in the studio and hang out after rehearsals to compare living and dancing in Paris and NYC. I had a great time practicing my French with these dancers and seeing the juxtaposition of Cunningham and Liz Gerring’s work. The performance of Horizon took place at Le Quai, an amazing arts space along the Maine River. The center seeks to include dance, theater, opera, world music, and more. The facilities are a treat compared to the often cramped dressing rooms of NYC theaters and there is a great restaurant on the roof of the building. Le Quai is also a hip hang out space for the community; our first day there a skateboard and tattoo festival was going on out front. Liz Gerring outside Le Quai Angers. After the performance, I had some time to check out the Dance is a Weapon exhibit in the lobby of the building. It was a great exhibition with audio/video media, iconic photos, and colorful information banners. I was excited to see pictures of Charles Weidman and Martha Graham among other modern dance pioneers. Between the exhibit about early American modern dance in a home that features Cunningham’s legacy, and performing work by the next generation of contemporary choreographers, I had an array of dance influences melding to create an amazing experience. 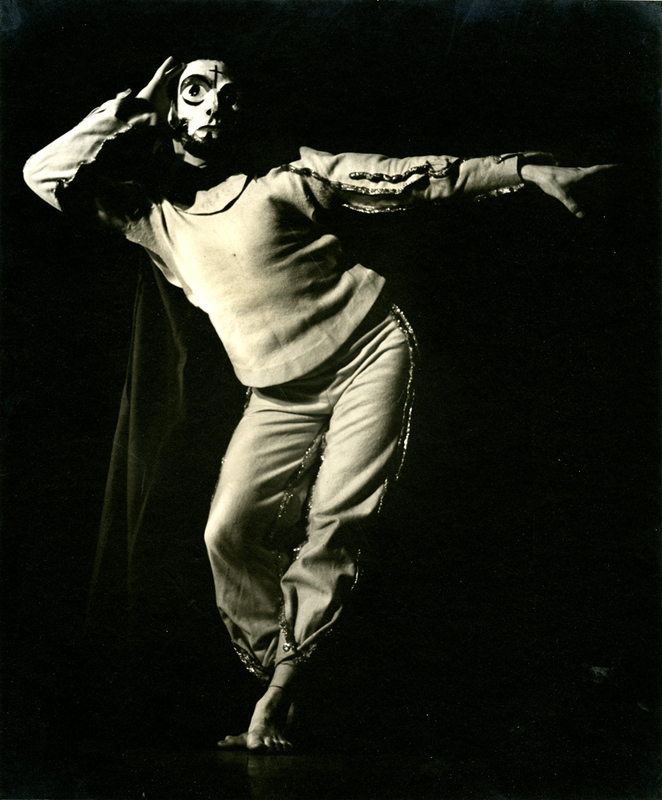 Photo of Charles Weidman in Race of Life included in the Dance is a Weapon exhibit. Julia post-performance at the Dance is a Weapon exhibit. In Liz Gerring’s Horizon, the dancers explore non-narrative, athletic movement to an original soundtrack by Michael Schumacher and set by Robert Wierzel. The collaborative nature of the work is reminiscent of Merce Cunningham’s creations that often incorporated multiple artists, from sound designers like John Cage to visual artists like Andy Warhol. 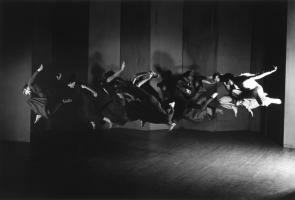 The movement is both contemporary and inclusive of codified modern dance techniques. The NYTimes describes the work as “fluently combin[ing] modern technique with a postmodern and quasi-analytical scrutiny of pedestrians and athletes.” The dancers use similar theories from Weidman technique including fall and recovery, flattening and curving of the spine, and released and suspended movements. At the close of Horizon, I do a series of repeated falls across the stage reminiscent of the falls in Weidman’s Brahms Waltzes. 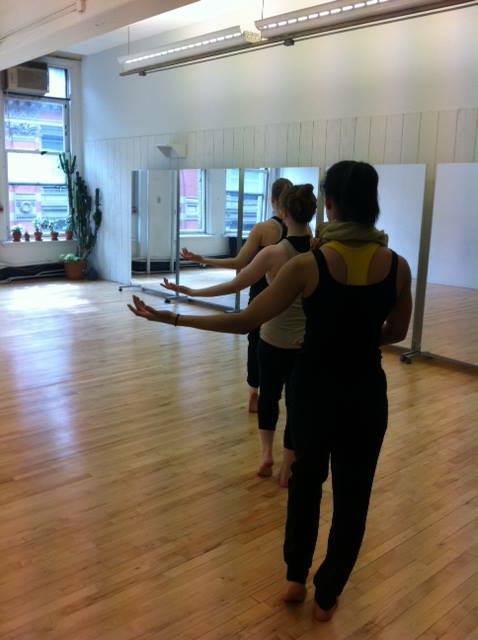 Liz Gerring Dance Company dancers using flat back in Horizon. Doris Humphrey and Charles Weidman were interested in how gravity and momentum affected movement, an idea that is explored in rehearsal for Liz Gerring Dance Company. All affectation is stripped away, and we are asked to fall, throw, lunge, run, and jump honestly. While ballet and modern techniques are inherent in our bodies, the movements are results of gravity working for or against us and how much momentum we are allotted. Sometimes we are asked to spring from one shape to the next without “winding up”, or conversely, we are asked to gather all of our energy and hurtle across the space. This cause and effect theory is intrinsic in Weidman’s “kinetic pantomime”, though he played with the order and explored reversing these properties under a narrative context. Charles Weidman exploring kinetic pantomime. When I was studying for my Bachelors of Fine Arts degree at NYU, I had the pleasure of performing Weidman’s Easter Oratorio and Brahms Waltzes. A great lesson I took from learning these works was the importance of timing and duration of movement. A lot of attention was placed on how long a développé or suspension took or how still we were while holding a position. Liz Gerring’s work Horizon is centered around the duration of movement and the sustaining of shapes. Often times the music is adjusted live to our performance of the work as each movement and section can vary slightly in timing. While Weidman used these methods to convey an idea or feeling, Horizon uses timing and duration to give the audience an experience similar to a natural time lapse film- abstract, evolving, and surprising. * For more detailed information on the characteristics of Humphrey-Weidman technique, see “A Reaffirmation of the Humphrey-Weidman Quality” by Svea Becker and Joenine Roberts, 1983, Dance Notation Journal vol 1 no 1 (available on the internet at the Dance Notation Bureau Theory Bulletin Board). The stage at Le Quai post Horizon performance. Myself (on the right) as a student learning Weidman’s “Brahms Waltzes”. Photo courtesy of Oberon’s Grove. The end of our tour included a train ride back to Paris where the company parted ways, some for the States and some for more Parisian nights. I was able to do some traveling through Paris, Barcelona, and Madrid. Now all back in NYC, the Liz Gerring Dance Company is now gearing up for the premier of their new work (T)here to (T)here at Baryshnikov Arts Center November 10-12th, 2016. (T)here to (T)here choreographed by Liz Gerring premiering November 10-12th. Me on the top of Montserrat in Barcelona, Spain. On April 18th, 2014, The Charles Weidman Dance Foundation held their fundraising event, Preservation of the Charles Weidman Moving Image Archive. The goal of the Preservation Project is to raise enough money to fully preserve and digitize the Weidman archive of film and video in the Jerome Robbins Archive Division at the New York Public Library for the Performing Arts. The fundraiser included two beautifully danced Weidman works. Nimbus Dance Works from Jersey City performed Lynchtown. The dancers were extremely technical and passionate and started off the night’s events with a bang! Foundation President of the Board, Robert Kosinski, said it was one of the best performances of Lynchtown he had ever seen! 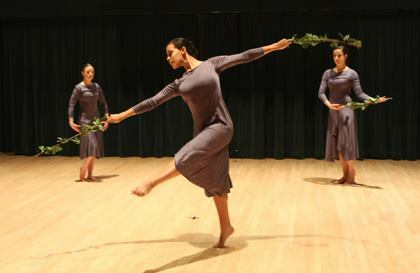 Nimbus Dance Works performing “Lynchtown” in 2013. Photo by Terry Lin. Attendees at the fundraiser also had the privilege to see Weidman’s trio Branches from the Easter Oratorio performed by Phoebe Rose Sandford, Sarah Hillmon, and Julia Jurgilewicz, all three Weidman alumni and members of RedCurrant Collective. 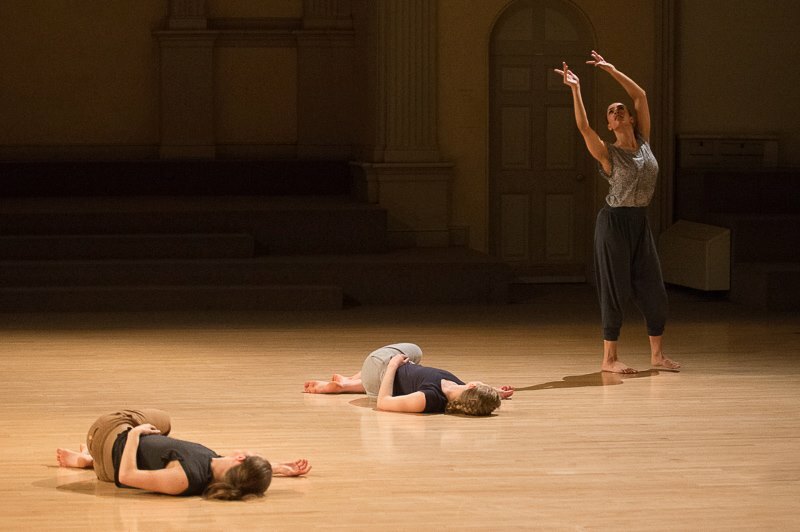 Julia Jurgilewicz staged this work from the video footage of a performance from 2010 by Tisch School of the Arts, NYU dancers at the 92nd St Y. 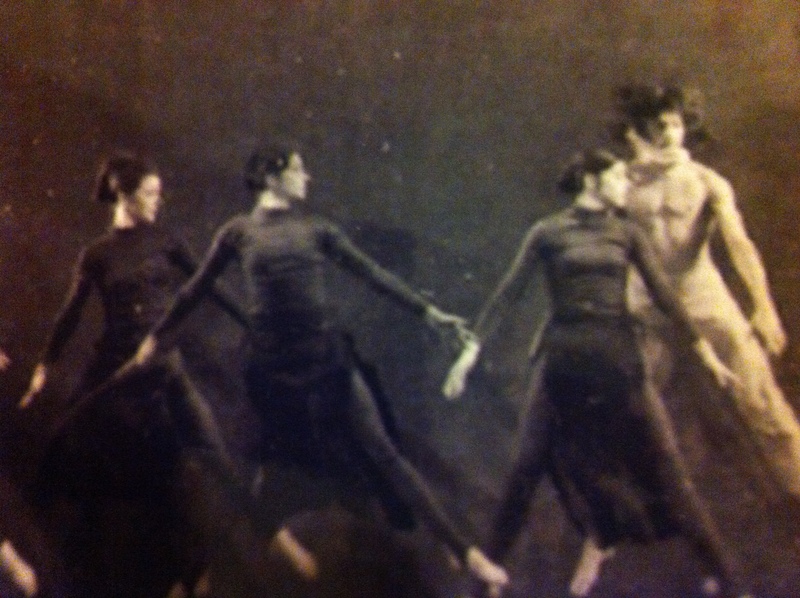 The Foundation’s vice-president, Margaret O’Sullivan, helped the dancers with details and intention. The dancers were graceful yet strong, and concluded the night’s performances with everyone looking forward to spring! 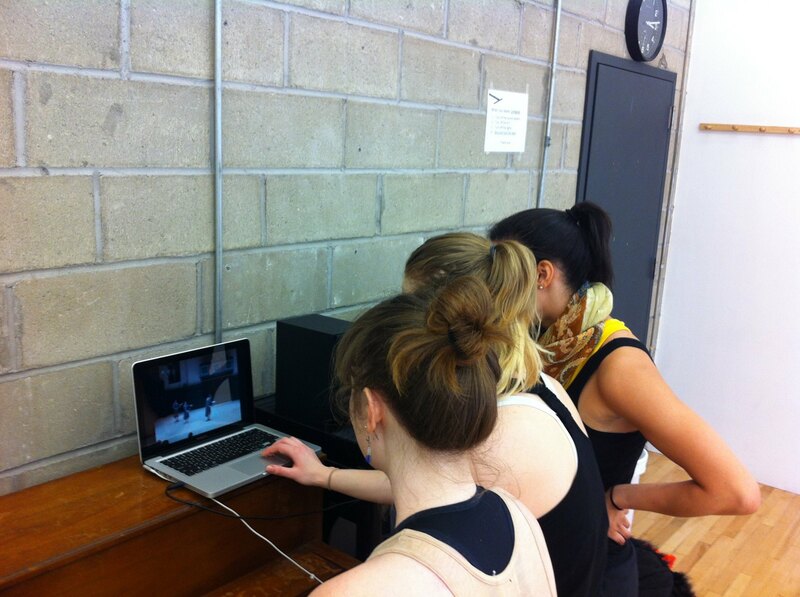 Dancers in rehearsal learning from video. Dancers running through “Branches” before the fundraiser. 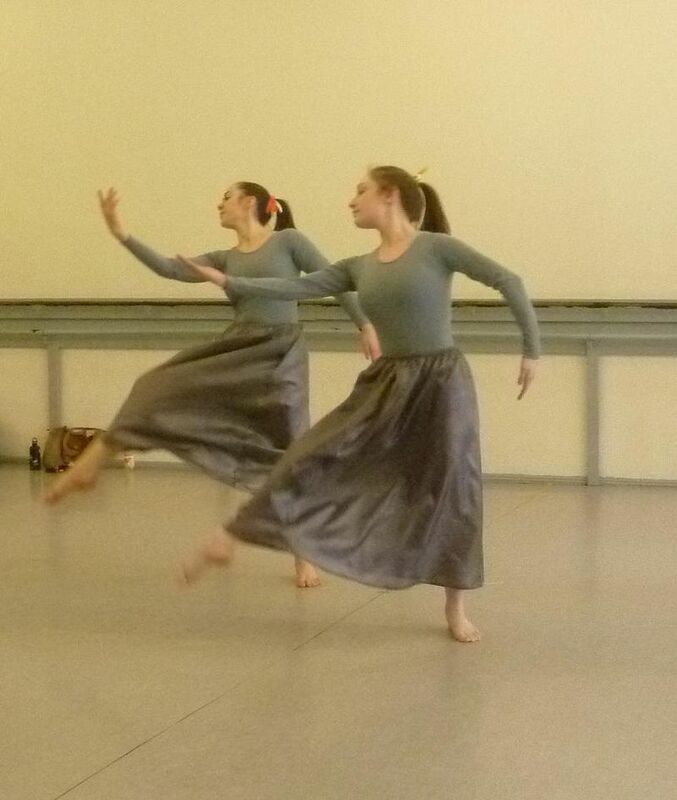 The Foundation was pleased to have such wonderful dancers performing these iconic Weidman works. 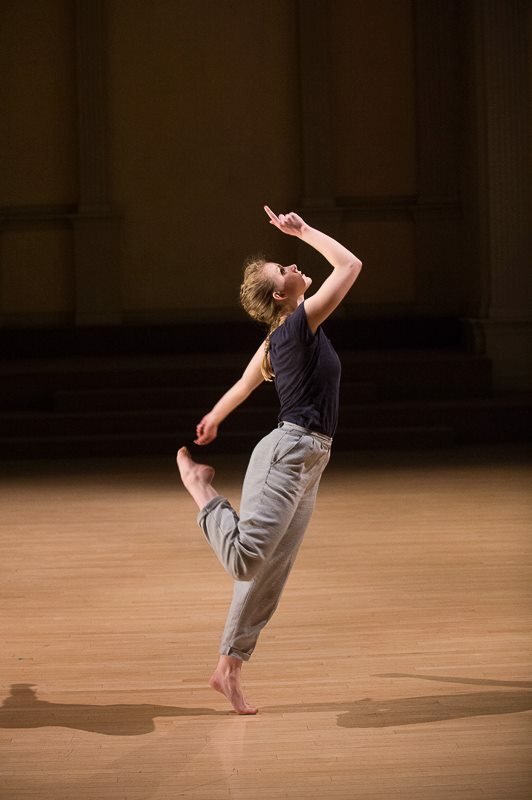 Dancer Sarah Hillmon performed for the Foundation at the 92nd St Y and Baryshnikov Arts Center in excerpts of the Easter Oratorio in her first year of her undergraduate degree at Tisch, NYU. She had the fun job of relearning her part for the fundraiser that she performed four years ago in the Branches trio. She remarked how different parts were harder or easier with her new body than when she was a dance student and how special it is to be able to revisit a part after years of different trainings and performances. Today, Sarah dances with Lucinda Childs Dance, touring often to Europe, Australia, and Asia, and has even graced the stage of BAM in Child’s Einstein on the Beach. Sarah also dances with Suzanne Beahrs Dance and is a founding member of RedCurrant Collective. Sarah is looking forward to touring to China this May. Sarah in “Amid” by Suzanne Beahrs Dance. Photo by Christopher Duggan. Sarah performing in “Branches” in 2010. Photo by Julie Lemberger. Phoebe Rose Sandford was new to Branches and did an incredible job of picking up the choreography in just three rehearsals! Phoebe performed Weidman’s Brahm’s Waltzes in 2012 at the 92nd St Y in her second year of her undergraduate degree at Tisch, NYU. Phoebe was excited to revisit Weidman technique as it was a good reminder of her ballet days as a student, but now she was able to apply her modern training and experience. Phoebe is a certified MBD yoga teacher at The Perri Institute for Mind and Body, and she also teaches dance at Cynthia King Dance Studio. She is a founding member of RedCurrant Collective, and in addition to dancing and choreographing for her collective, she dances for Anne Zuerner and mishiDance. The Foundation was so pleased to have her dance for us again! Phoebe in “Ascending and Descending” by mishiDance. Photo by Sharon Harsa. Phoebe in rehearsal for “Brahm’s Waltzes” in 2011. Photo courtesy of Oberon’s Grove. Julia Jurgilewicz performed both the Easter Oratorio and the Brahm’s Waltzes while in her undergraduate program at Tisch, NYU. Julia had an interesting situation with Branches where she had learned the part of Sarah Hillmon back in 2010 and then learned a different role for the fundraiser. Julia remarked that “it was like a fun puzzle, fitting together the ensemble parts that I remembered from four years ago and my new solo moments.” She enjoyed performing the work with her deeper understanding of movement and appreciated the opportunity to see how much had changed in her dancing in four years. Julia has performed in three productions at the Metropolitan Opera and dances for Suzanne Beahrs Dance, Bodystories:Teresa Fellion Dance, and Erica Essner Performance Co-Op. When she is not dancing, Julia works for Ballet Tech bringing free ballet training to public school students in the five boroughs. She is looking forward to dancing in Bulgaria this June and creating her own work through RedCurrant Collective to be presented in the fall. Julia dancing in “Amid” by Suzanne Beahrs Dance. Photo by Christopher Duggan. Julia in rehearsal for “Brahm’s Waltzes” in 2011. Photo courtesy of Oberon’s Grove. 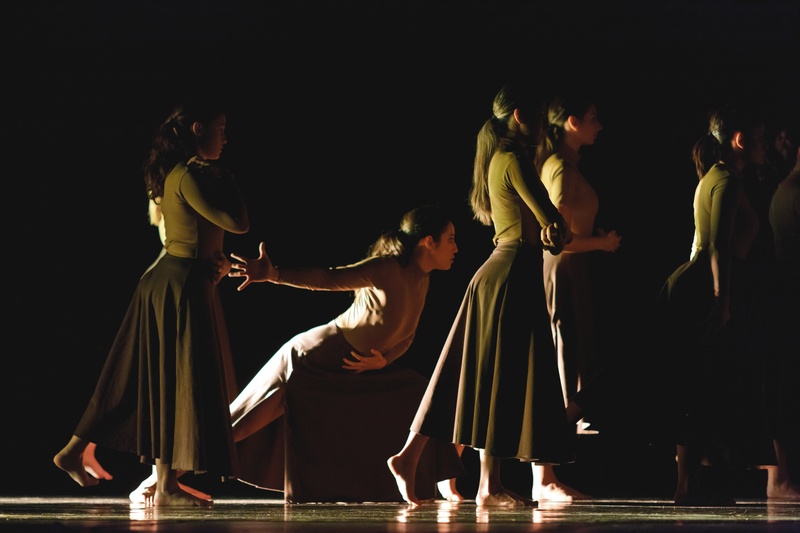 The Charles Weidman Dance Foundation is lucky to have such wonderful dancers donating their time, skill, and passion to keeping Charles Weidman’s legacy alive and is pleased that the Foundation’s relationship with Tisch Dance has flourished with continued collaborations. 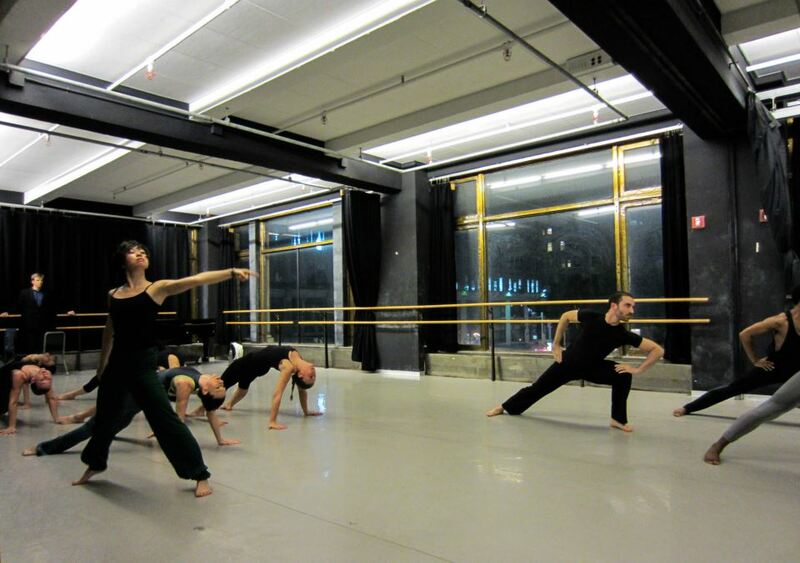 The Foundation looks forward to hopefully staging more Weidman works on the world’s talented dancers and students. To find out more about the Foundation’s missions and goals, visit our website at www.charlesweidman.org. On May 7, in historic downtown Jersey City, Tachair Bookshoppe hosted a fascinating, multimedia lecture by Dr. Jeff Friedman. “Weidman’s Lynchtown: American Dialectics, Moral Questions and the Art of Persuasion” considered Weidman’s work from a dazzling array of perspectives including Laban Movement Analysis, Piaget’s ideas on the development of morality in children, and Cicero’s importance of gesture in Oratory. Nimbus Dance Works dancer, Yuko Monden, demonstrated movement from Lynchtown as Dr. Friedman related them to Laban’s concepts of free flow, bound flow, weight, spoking and arcing. The entrance walk of the lynch mob is an example of “bound flow”, while Monden’s final exit as she leaps off the stage is “free flow.” Using archival footage, Friedman also showed how the lynch mob’s entrance creates a “wall of movement” that physically and emotionally separates the audience from the victim. Dr. Friedman went on to discuss Weidman’s early interest in comedy and satire. 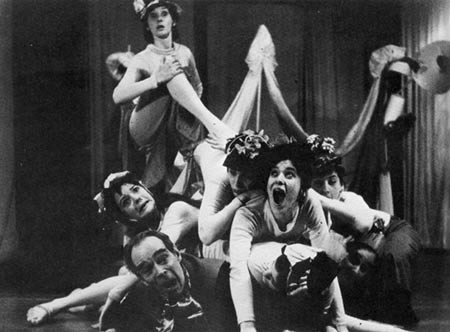 Archival photos of The Happy Hypocrite (1931) and The School for Husbands (1933) (choreographed with Doris Humphrey) were used as examples. Dr. Friedman’s comments on the social significance of satire were especially interesting. The lecture was followed by a lively discussion on a wide range of topics including the psychological challenges faced by performers in portraying such evil, the choice of the smallest dancer to portray “the Incitor” character of the mob, how the dances in Atavisms (Stock Exchange, Bargain Counter, and Lynchtown) relate to current events, mob behavior, and how best to teach about fascism. If you missed Dr. Friedman’s lecture, you still have one more opportunity to attend on May 23 at 7pm at the Highland Park Public Library, 31 North Highland Park, Highland Park, NJ. For live performances of Lynchtown, don’t miss Nimbus Dance Works’ Jersey City spring season, “UNPLUGGED” May 30,31, and June 1 at the Barrow Mansion, 83 Wayne Street, Jersey City. This past autumn, our Vice-President, Margaret O’Sullivan, traveled to New Jersey to start working with contemporary company Nimbus Dance Works. Under the direction of Samuel Pott, the company will be performing Weidman’s iconic work, Lynchtown, this winter in their NYC season February 15-17th at the Alvin Ailey Citigroup Theater. Nimbus dancers in rehearsal for Lynchtown. Photo by PeiJu Chien-Pott. Because of it’s alarmingly honest essence, universal reach, and timeless topic, performances of Lynchtown have surfaced throughout the years. 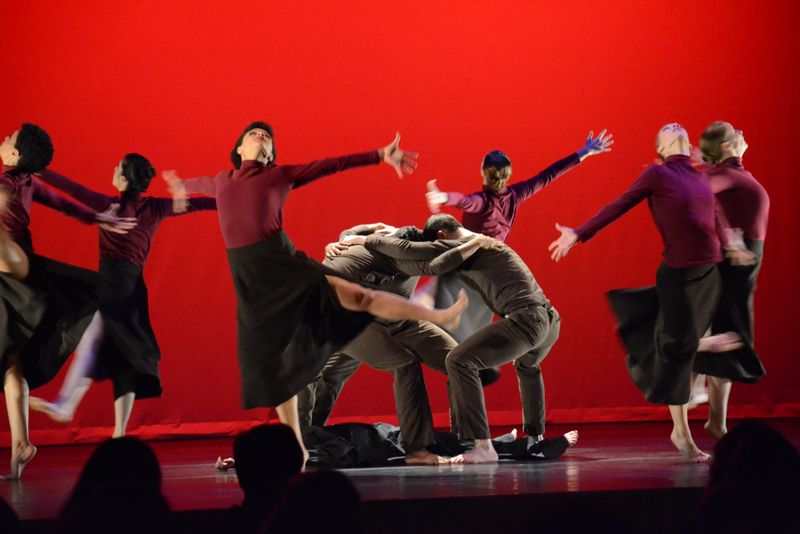 Most recently, Montclair State University dancers performed Weidman’s Lynchtown accompanied by live percussionists and clarinetist in a bill paired with Weidman’s Brahms Waltzes at the 92nd St Y in April 2011. Lynchtown was also shown in 1994 at the Humphrey-Weidman Gala: Dances from Their Years Together and in 1993 at SUNY Purchase and in Taiwan, China. When asked about re-staging Lynchtown, Margaret O’Sullivan commented that “the hardest part for dancers is allowing themselves to really indulge and enjoy the grotesque and focus on the event. The dancers never face or look at the audience and it is very into the ground in very deep, deep plies.” She compares the movement to that of animals and recalls that in her first Lynchtown rehearsal as a dancer, Charles told them to be more “lascivious” with their movement. One of the benefits and treats of learning Weidman dances from Margaret is the refreshingly “old” method of learning everything from memory. Nowadays, dancers develop and hone their skills in reversing movement learnt from a computer screen. Nimbus dancer Elena Valls expressed how in this Weidman Foundation/Nimbus collaboration, the dancers “did not learn anything from a video; it was all [Margaret’s] memory and from watching her do the movement. That made it way more enjoyable. She noticed the smallest details, like the Humphrey foot (which we call the Barbie foot), the tension in the hands and neck, and how your eyes really tell the story.”. Nimbus Dance Works dancers in rehearsal. Photo by PeiJu Chien-Pott. The company will be performing Lynchtown in their NYC season on February 15-17th at the Alvin Ailey Citigroup Theater. Director Sam Pott has plans to create a new work based off similar ideas and themes addressed in Weidman’s Lynchtown. Nimbus’s future plans involve traveling to New Jersey schools to show Weidman’s iconic work and have the children create their own versions of Weidman’s dance based on ideas of intolerance and hate. 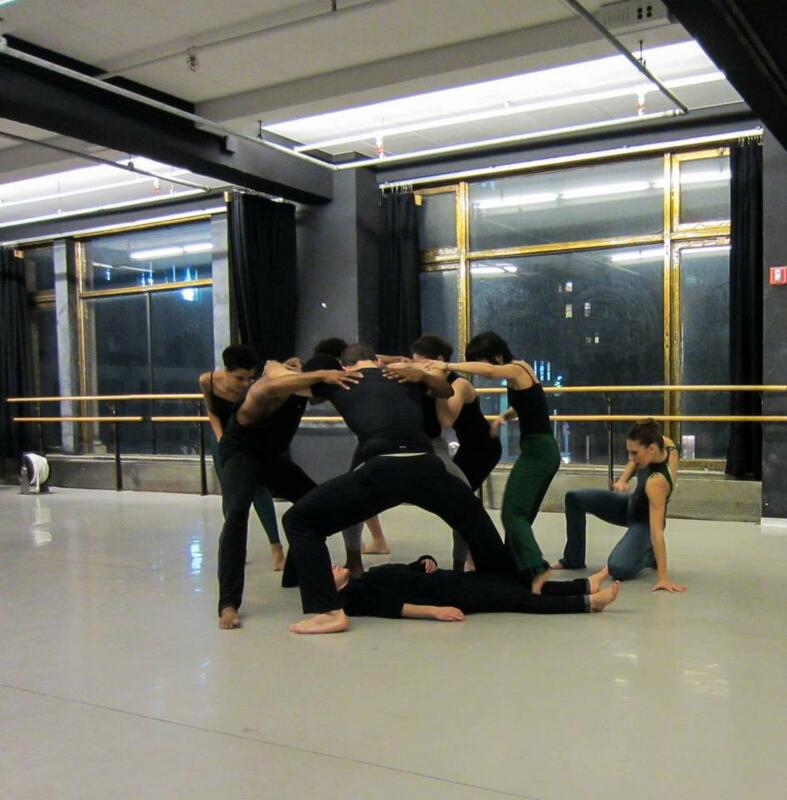 For more information on the Nimbus Dance Works NYC performance, visit their website here. Sources: Olga Maynard. American Modern Dancers The Pioneers. Copyright 1965. Lynchtown quote taken from myloc.gov.